The Gandavyuha Sutra or Sutra of the Entry into the Realm of Reality is a Buddhist Sutra of Indian origin that records one of the world's most celebrated spiritual pilgrimages, and comprises the 39th chapter of the Flower Garland Sutra. The Sutra is described as the "Sudhana's quest for the ultimate truth", as the sutra chronicles the journey of a disciple, Sudhana, as he encounters various teachings and Bodhisattvas until his journey reaches full circle and he awakens to teachings of the Buddha. 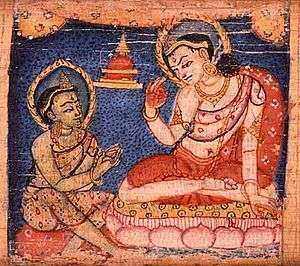 Sudhana learning from one of the fifty-two teachers along his journey toward enlightenment. Sanskrit manuscript, 11-12th century. The penultimate master that Sudhana visits is the Mañjuśrī Bodhisattva, the bodhisattva of great wisdom. Thus, one of the grandest of pilgrimages approaches its conclusion by revisiting where it began. The Gaṇḍavyūha suggests that with a subtle shift of perspective we may come to see that the enlightenment that the pilgrim so fervently sought was not only with him at every stage of his journey, but before it began as well—that enlightenment is not something to be gained, but "something" the pilgrim never departed from. The final master that Sudhana visits is the bodhisattva Samantabhadra, who teaches him that wisdom only exists for the sake of putting it into practice; that it is only good insofar as it benefits all living beings. Samantabhadra concludes with a prayer of aspiration to buddhahood, which is recited by those who practice according to Atiśa's Bodhipathapradīpa, the foundation of the lamrim textual traditions of Tibetan Buddhism. In a November 1, 2016 article in the Bhutanese newspaper Kuensel  mention was made of the annual Moenlam (or Monlam in Tibetan language) as performed by the Drukpa Kagyu denomination of Buddhism. During this Moenlam a prayer is said that stems from the Gaṇḍavyūha. The Himalayan traditions use the translation made by Shiksananda, not the earlier version of Buddhabhadra. The last four lines of the Gaṇḍavyūha, as translated by Th. Cleary  the text reads: "By the endless surpassing blessing realized from dedication / To the practice of good, / May worldlings submerged in the torrent of passion / Go to the higher realm of Infinite Light." In the Gaṇḍavyūha there is no mention of Amitabha Buddha, nor of "the supreme realms of Amitabha." ↑ Warder, A. K. Warder (2000). Indian Buddhism. Motilal Banarsidass Publ. p. 402. ISBN 978-81-208-1741-8. The title Gaṇḍavyūha is obscure, being generally interpreted as 'array of flowers', 'bouquet'. it is just possible that the rhetorical called gaṇḍa, a speech having a double meaning (understood differently by two hearers), should be thought of here. ↑ Doniger, Wendy (January 1999). Merriam-Webster's Encyclopedia of World Religions. Merriam-Webster. p. 365. ISBN 978-0-87779-044-0. ↑ Fontein, Jan (1967). The pilgrimage of Sudhana: a study of Gandavyuha illustrations. Walter de Gruyter. ISBN 978-3-11-156269-8. ↑ Cleary, Thomas. The Flower Ornament Scripture 3, Entry into the Realm of Reality / Transl. by Thomas Cleary. Boulder: Shambhala, 1987, p. 369. ↑ "samantabhadracaryāpraṇidhānam". Digital Sanskrit Buddhist Canon. Retrieved 1 June 2013. ↑ "bhadracarīpraṇidhānastotram". Digital Sanskrit Buddhist Canon. ↑ Lung, Jang. "King of Prayers" (PDF). Kalachakranet. Retrieved 1 June 2013.